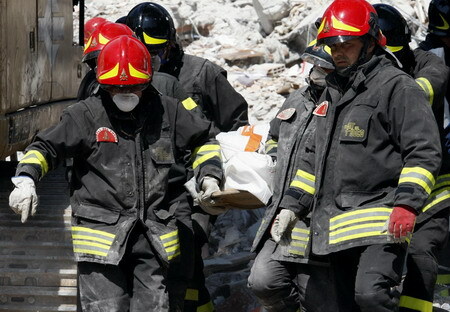 L'AQUILA, Italy -- Prime Minister Silvio Berlusconi says that 207 people died in the powerful quake that devastated part of central Italy, and 15 people remain missing. Berlusconi said Tuesday that at least 100 of the roughly 1,000 injured people are in serious condition. He says 190 of the victims have been identified. Berlusconi told a press conference after surveying the damage by helicopter that rescue efforts would continue for another 48 hours and trapped people had diminishing chances of survival. The magnitide-6.3 quake struck the central Italian city of L'Aquila and surrounding villages early Monday, leveling buildings and reducing entire blocks to a pile of rubble and dust. A strong aftershock sent firefighters and rescuers scrambling Tuesday morning from a collapsed dormitory where they have been working frantically to find university students trapped by the powerful earthquake that devastated this central Italian city. There have been a series of aftershocks since the 6.3 quake early Monday. Tuesday's aftershock appeared strongest in L'Aquila, a city of Romanesque, Gothic, Baroque and Renaissance architectural treasures in a valley surrounded by the snowcapped Apennine mountains.